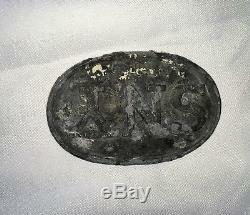 Civil War belt plate lead filler relic. 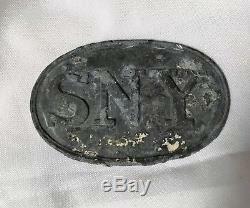 State of New York (SNY Plate) This is what remains after salt water has caused separation of the lead filler and the brass belt plate stamping. 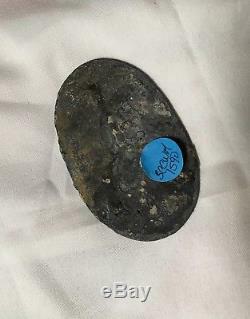 This unique item was recovered in 1987 from the wreck of the "Governor" off the South Carolina coast near Myrtle Beach. The lead filler measures 54.85 mm wide, 86.40 mm in length, and weighs 3.6 ounces. The tongue and paws are missing of course as is the outer brass plate, but the filler is a crisp duplicate of the brass stamping as the molten lead was poured into the brass plate and the puppy paws and tongue attached. Unless the item meets all state and local codes of law. We have marketed historical antiques since 1972 and attempt to describe them correctly. But, as collectors, each of us see things differently at times. We will attempt to work out any differences of opinion with you direct. We are not responsible for product misuse. Our mailing address is Myrtle Beach Indoor Shooting Range, inc. Thank you for shopping with us. We at Myrtle Beach Indoor Shooting Range are always interested in your opinions. 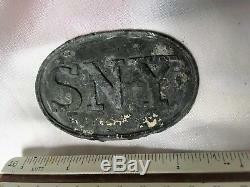 The item "Belt Plate, State of New York, Civil War lead filler shipwreck recovery" is in sale since Monday, June 25, 2018. This item is in the category "Collectibles\Militaria\Civil War (1861-65)\Original Period Items\Other Civil War Original Items". 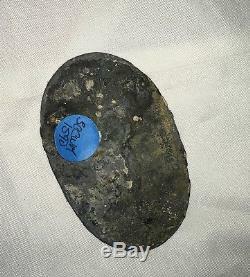 The seller is "tanglefoot1" and is located in Myrtle Beach, South Carolina. This item can be shipped to United States.